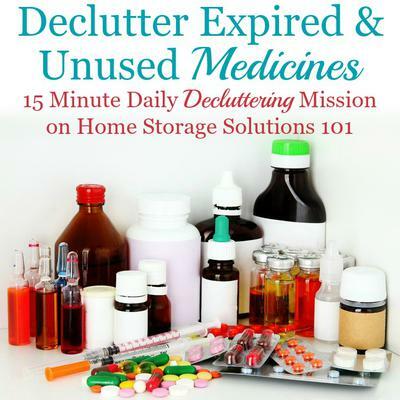 Today's mission is to declutter expired and unused medicines, and then use proper medicine disposal techniques to get rid of this clutter. 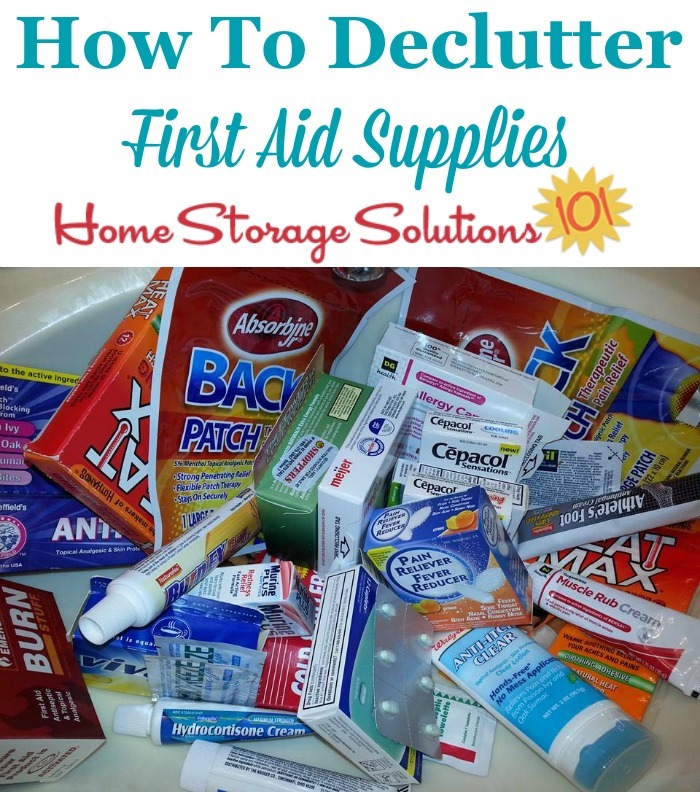 This mission is designed to be done while we work through the Medicine & First Aid Supplies Organization Challenge here on the site, which is one of the challenges in the 52 Week Organized Home Challenge. Of course, this mission can be done at any time you feel you need it. I do suggest that this task be done at least once a year, to make sure that the medical supplies you have on hand in your home are fresh and ready for use. This mission is pretty straight forward, at least the part of the mission where you identify what types of items to get rid of. You should get rid of medications, both prescription and over the counter, as well as first aid supplies, that have expired, that you have excess of, or that you don't or won't use. It's typically easy to find the expiration dates of medication right on their packaging, or to realize when you've got too much of something to use it within a reasonable time period. 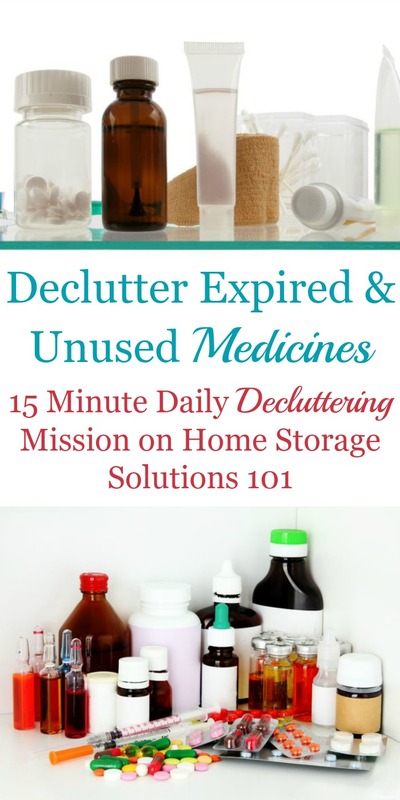 However, the part of this mission that can be a bit more difficult to deal with is figuring out what to do with these old medications once you've decided to get them out of your home. Unlike many items, which you can just throw in the trash, or donate to someone else, it is much more difficult (and sometimes illegal) to give away medications to others. It can also have environmental and health risks. If you have first aid supplies or over the counter medications which are unopened and not expired, but that you decide to get rid of, I would encourage you to donate these items to a food pantry or similar charitable organization. However, for other types of medicines, such as prescriptions which you cannot legally allow others to have, I have written an entire article that discusses exactly how to dispose of these drugs and medicines, safely, legally and easily. Read my Prescription Drug & OTC Medication Disposal Guide here. Below I've gathered quite a few photos from readers who've already done this mission to show you what you can accomplish with just a few minutes of decluttering effort. As you might imagine, this is the type of mission that just about all of us need to complete, at least once a year. After all, who doesn't have at least some first aid supplies or at least over the counter medicines in their home? Here are several photos from readers who've already done the mission to show you what you can accomplish and also to remind you of all the places you need to search out these medications, supplements, and first aid supplies, within your home. 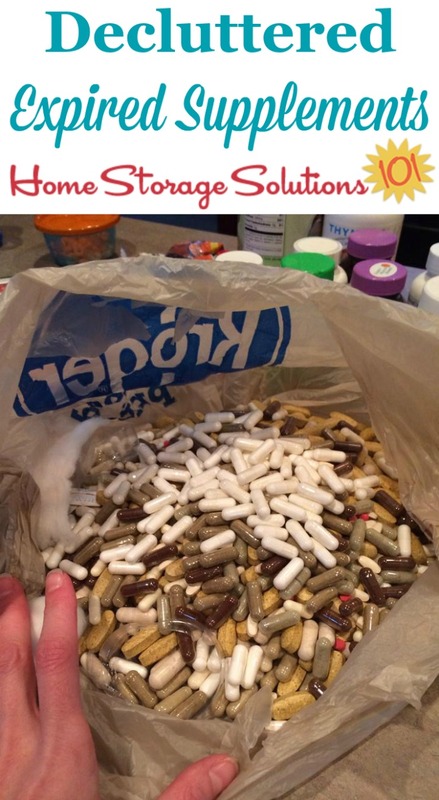 The before and after photos above were sent in by Gena, who was really surprised to find so much expired medication within her kitchen medicine cabinet. She did a great job clearing it out though, didn't she? This next photo, above, is from another reader, Jill, who said, "Oh my gosh- just completed my 'mission'!!! Not only did I get rid of a bunch of spices- but got rid of tons of expired supplements!!!" Great job Jill! Good for you! Remember to check out the drug disposal guide I mentioned above, to make sure you're disposing of these supplements properly. This next photo above is from Susan. She said, "Cleaning out the medicine cabinet ... kind of embarrassed to post that this is all expired product; though happy that we didn't have the occasion to use it." I know what you mean Susan! It can be tough to let go of things you've purchased but not used, but I know you'll be glad you did. This will allow you to make room for any new medications you may need to keep on hand, and hopefully also help you save money in the future if you realize you don't need certain items again, so you don't have to repurchase them. Finally, this photo above was sent in by Joyce. She said, "Cleaning out bathroom cabinet at the mountain cabin. Found these in the back! The little vial is Carters little liver pills!" 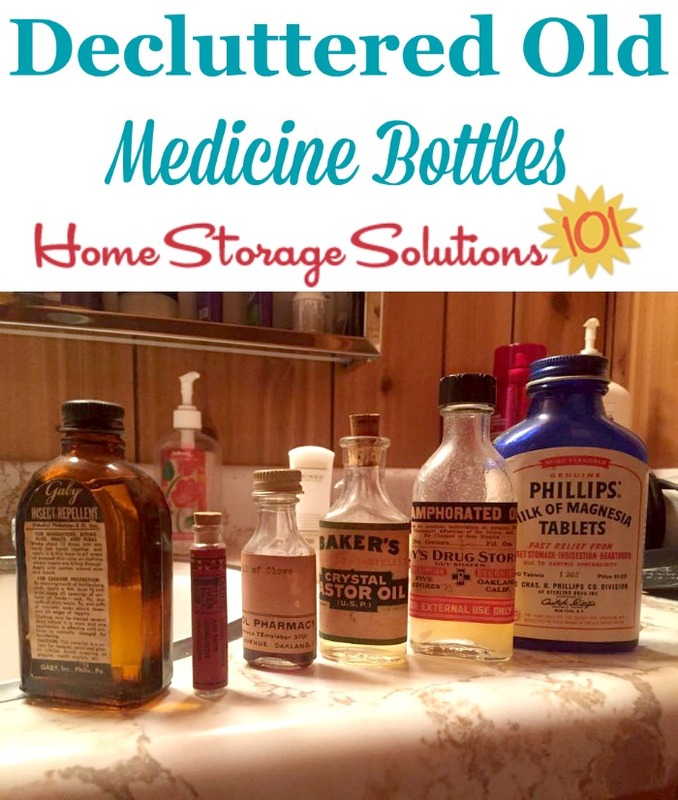 I'd be curious, what's the oldest medication you found when decluttering? Once you do this mission I'd love to hear what you find in the comments below. 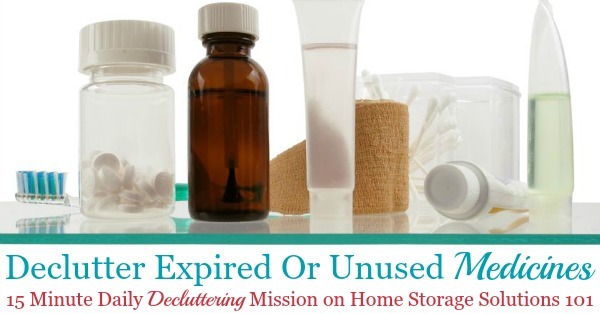 Are You Ready To Declutter Expired & Unused Medication? 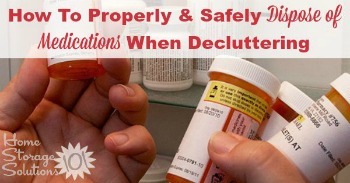 Are you ready to get rid of your medication clutter now? I hope so. 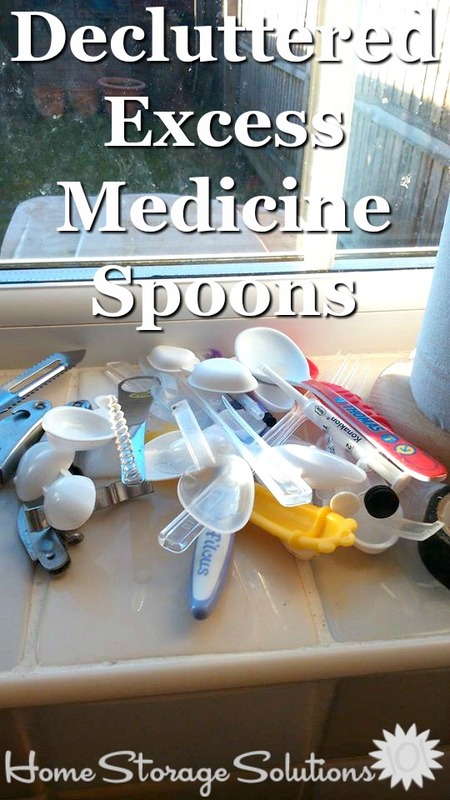 Here's one more photo, this one sent in by a reader, Natasha, who along with dealing with her medicine and supplements, also got rid of other medical accessories, in her case an excess of medication spoons. Make sure when you're doing this mission you do the same!